The Rebel Sweetheart. : Discovering Napoleon. "Not to prime is a crime!" This according to Napoleon Perdis, a Greek Australian makeup artist who entered the beauty business in the 1990s. He catapulted to fame soon after he opened his very first concept store in Sydney. If my memory serves me right, I first came across the name Napoleon Perdis while reading Christine's popular beauty blog, Temptalia. As many of my readers know, I have a strong bias for Asian cosmetic brands (Korean brands, in particular). But every once in awhile I'd come across western or European brands that would pique my curiosity and eventually get my seal of approval. Like this one, for instance. Napoleon Perdis Tropical Heat Collection in Sand. 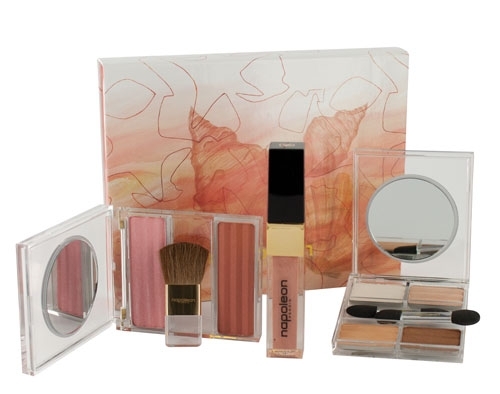 In the summer of 2011, Napoleon Perdis released the Tropical Heat Collection - a multi-kit that includes a Prismatic Eyeshadow Quad, a Cheek to Chic Blush Duo, and a Prismatic Lip Veil. I can't remember the regular price of this set, but I got this at a discounted price of $39. Not bad considering you're actually paying for three different products. The collection comes in three shade selections - Ocean, Coral, and Sand. The latter, as depicted above, easily became my favorite. For some reason this set got relegated to the bottom of my makeup stash; I reckon it has something to do with my going gaga over dark eyeshadows and smokey eyes last year, haha. But now that I'm leaning towards nudes and neutrals and looks that are 'school-friendly' (as in something that I can wear to my son's school functions or PTA meetings), I find myself reaching for the eyeshadow palette and the blush quite often these days. And although this collection was intended for summer, the colors can pretty much be worn anytime of the year. ah, I haven't encountered Napoleon yet. There' just too many cosmetic brands out there! I like the pink shades... very fresh-looking. Love the colors! But yeah, just like Earth, never encountered this brand as yet. This should be better as you can use it as an everyday make up. i'm not much into makeup but this is the first time that I've heard Napoleon Perdis. Nice selection of eyeshadows and a good bargain for $39! Great post! Thank you so much for sharing. I haven't tried this yet, but I'm really curious, now, as I have heard some really good things about this brand. Thanks, again! Let me know when you find out the regular price for this. I'm all about good makeup. I like trying everything. Right now I have an obsession with natural makeup though, but wouldn't mind trying this. Your skin looks so nice that I feel like if you could try it and think it great, then why not? Napoleon sounds masculine... but the products is so feminine.. i like the color though.. I love this color pallet. I admit I have very fair skin and usually shy away from Asian brands. But this is one I would try. Thank you for sharing. I often wish that I was more of a girly girl, but I am not. I tend to wear make up for special occasions only. I bought some new eye shadow at Christmas and I keep forgetting to wear it. The colors are just in time for summer. I've never heard of Napoleon until now. I like the shades on the palette. i have so much to learn about the makeup world!